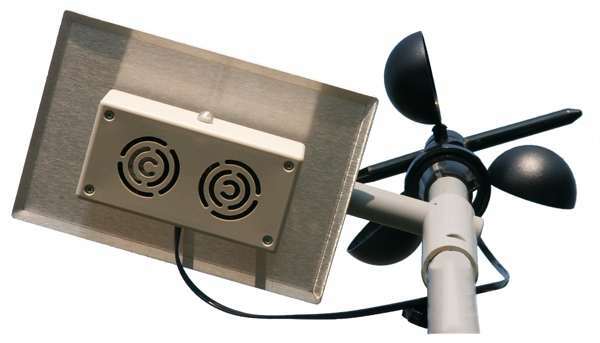 The gold standard in weatherstations for professional and sportsman racers. The AltaCom II is trailer-based, fan aspirated, remote sensing professional weatherstation with weather paging, data logging, and live ET and TS predictions for drag racers. Software and cabling included*. 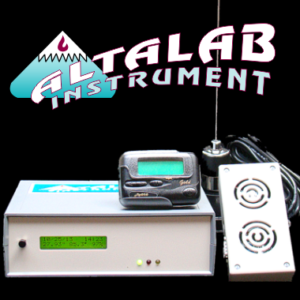 AltaCom II is an excellent weatherstation for tuning, racing and dyno work. The fan-aspirated remote sensor housing are mounted above the trailer roof or in the plenum. The remote cable permits flexible setup, with the console located for convenient viewing. The LCD on the console updates every 20 seconds. The console logs data to internal memory once every 10 minutes and Merlin software can log weather every 5 minutes on your PC with the included serial cable for downloading and live data display on screen. Both 12 volt power cord and 110 supply are included. Temperature 0 – 125 x 0.1F x 1% Semiconductor with a linear output. Relative Humidity 0 – 100% x 0.1% x 3% IC (Integrated Circuit) with linear output and multi-point calibration for full scale repeatability. Absolute Barometric Pressure 21 – 31.5″Hg x 0.01 x 0.1 IC with built-in signal conditioning and temperature compensation. Ambient Light 0-1000 IC with linear output. Front panel of the console showing scroll switch, backlit LCD and indicator lights. Front and Rear Panels of AltaCom II Rear panel of the console showing on-off switch, antenna connections, power jack, serial number, FCC ID, Remote Sensor Housing Connection, Serial Cable Connection, and extra data ports. 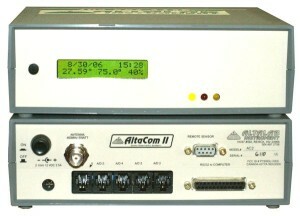 AltaCom II Remote Sensor on mast with optional Anemometer. *USB to Serial Adapter not included.